● Do not depress the accelerator pedal while shifting from P (Park) or N (Neutral) to R (Reverse), D (Drive), Ds (Drive Sport) or manual shift mode (if so equipped). Always depress the brake pedal until shifting is completed. Failure to do so could cause you to lose control and have an accident. ● Cold engine idle speed is high, so use caution when shifting into a forward or reverse gear before the engine has warmed up. ● Do not downshift abruptly on slippery roads. This may cause a loss of control. ● Never shift to P (Park) or R (Reverse) while the vehicle is moving. This could cause an accident. ● Except in an emergency, do not shift to the N (Neutral) position while driving. ● When stopping the vehicle on an uphill grade, do not hold the vehicle by depressing the accelerator pedal. The foot brake should be used for this purpose. The CVT in your vehicle is electronically controlled to produce maximum power and smooth operation. ● D (Drive) mode - Move the shift lever to D (Drive), the transmission is in the normal forward automatic driving mode. The position indicator in the meter shows a “D”. The D (Drive) mode does not produce a gear change sensation like a traditional automatic transmission. ● Ds (Drive Sport) mode - Move the shift lever from D (Drive) to the to Ds (Drive Sport). The position indicator in the meter shows a “Ds”. In Ds (Drive Sport) mode, transmission operation changes to Sporty” driving shift operation, creating a more aggressive acceleration feeling than the D (Drive) mode and a gear change sensation when the driver accelerates or when using the shift paddles (if so equipped). 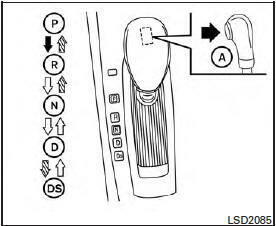 During Ds (Drive Sport) mode operation, the driver must move the shift lever from Ds mode to D mode and back again to re-select Ds (Drive Sport) mode. ● To cancel the Ds mode, return the shift lever to the D (Drive) position. The transmission returns to the automatic drive mode. ● M (Manual) mode (if so equipped) - With the shift lever in the Ds (Drive Sport) mode, using the shift paddles (if so equipped) up (+) or down (–) produces noticeable upshifts and downshifts. The position indicator in the meter shows a “M”. ● To Ds (Drive Sport) mode return the shift lever to the D (Drive) mode. Engine power may be automatically reduced to protect the CVT if the engine speed increases quickly when driving on slippery roads or while being tested on some dynamometers. 1. After starting the engine, fully depress the foot brake pedal before moving the shift lever out of the P (Park) position. 2. Keep the foot brake pedal depressed and move the shift lever into a driving gear. 3. Release the foot brake, then gradually start the vehicle in motion. 4. Stop the vehicle completely before shifting the shift lever to the P (Park) position. The CVT is designed so the foot brake pedal MUST be depressed before shifting from P (Park) to any drive position while the ignition switch is in the ON position. 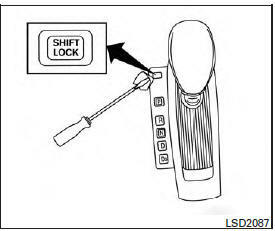 The shift lever cannot be moved out of P (Park) and into any of the other gear positions if the ignition switch is pushed to the LOCK position. After starting the engine, fully depress the brake pedal and move the shift lever from P (Park) to any of the desired shift positions. To prevent transmission damage, use the P (Park) or R (Reverse) position only when the vehicle is completely stopped. Use the P (Park) shift lever position when the vehicle is parked or when starting the engine. Make sure the vehicle is completely stopped. The brake pedal should be depressed to move the shift lever from N (Neutral) or any drive position to P (Park). Apply the parking brake. When parking on a hill, apply the parking brake first, then move the shift lever into the P (Park) position. Use the R (Reverse) position to back up. Make sure the vehicle is completely stopped before selecting the R (Reverse) position. The brake pedal must be depressed to move the shift lever from P (Park), N (Neutral) or any drive position to R (Reverse). 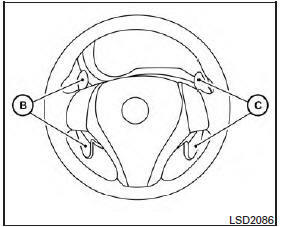 When the shift lever is shifted from the D (Drive) to Ds (Drive Sport) position, the transmission enters the Ds (Drive Sport) mode. Moving the shift lever to the Ds (Drive Sport) position allows you to enjoy “sporty” driving shift operation on a winding road and feel smooth acceleration or deceleration on a hilly road by moving in a lower gear automatically. 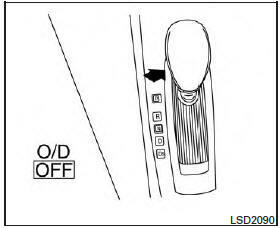 When canceling the DS mode, return the shift lever to the D (Drive) position. The transmission returns to the normal driving mode. 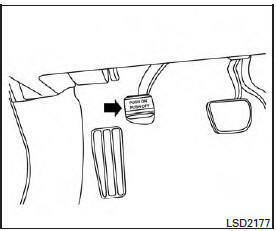 When the shift lever is in the Ds (Drive Sport) position, the transmission is ready for the manual shift mode. Shift ranges can be selected manually by pulling the right-side or left-side paddle shifter. When shifting up, pull the right side paddle shifter (+) C (if so equipped). The transmission shifts to the higher range. When shifting down, pull the left side paddle shifter ( ) B (if so equipped). The transmission shifts to the lower range. When canceling the manual shift mode, return the shift lever to the D (Drive) position. The transmission returns to the normal driving mode. When you pull the paddle shifter (if so equipped) while in the D (Drive) position, the transmission will shift to the upper or lower range temporarily. The transmission will automatically return to the D (Drive) position after a short period of time. If you want to return to the D (Drive) position manually, pull and hold the paddle shifter for about 1.5 seconds. In the manual shift mode, the shift range is displayed on the position indicator in the meter. Use this position for all normal forward driving at highway speeds. Use this position when driving up long slopes, or for engine braking when driving down long slopes. Use for hill climbing or engine braking on downhill grades. ● Remember not to drive at high speeds for extended periods of time in lower than 7 range. This reduces fuel economy. ● Moving the shift lever rapidly to the same side twice will shift the ranges in succession. Return the shift lever to the D (Drive) position to return the transmission to the normal driving mode. ● In the manual shift mode, the transmission may not shift to the selected gear. This helps maintain driving performance and reduces the chance of vehicle damage or loss of control. ● In the manual shift mode, the transmission may shift up automatically to a higher range than selected if the engine speed is too high. When the vehicle speed decreases, the transmission automatically shifts down and shifts to 1st gear before the vehicle comes to a stop. ● CVT operation is limited to automatic drive mode when CVT fluid temperature is extremely low even if manual shift mode is selected. This is not a malfunction. When CVT fluid warms up, manual mode can be selected. ● When the CVT fluid temperature is high, the shift range may upshift in lower rpm than usual. This is not a malfunction. If the battery charge is low or discharged, the shift lever may not be moved from the P (Park) position even with the brake pedal depressed and the shift lever button pushed. It will be necessary to jump start or have your battery charged, see “Jump starting” in the “In case of emergency” section. Contact your NISSAN dealer or a professional towing service. 1. Push the ignition switch to the LOCK position. 3. Using a protective cloth on the tip of a 3 mm screwdriver, remove the shift lock release cover. ● If available, a plastic trim tool can also be used. 4. Insert the small screwdriver in the shift lock release slot and push down. 5. Move the shift lever to the N (Neutral) position while holding down the shift lock release. If the shift lever cannot be moved out of P (Park), have a NISSAN dealer check the transmission as soon as possible. If the shift lever cannot be moved from the P (Park) position while the engine is running and the brake pedal is depressed, the stop lights may not work. Malfunctioning stop lights could cause an accident injuring yourself and others. light in the instrument panel illuminates. See “Overdrive off indicator light” in the “Instruments and controls” section of this manual. Use the Overdrive off mode when you need improved engine braking. Each time the engine is started, or when the shift lever is shifted to any position other than D (Drive), the Overdrive off mode will be automatically turned off. This transmission has a high fluid temperature protection mode. If the fluid temperature becomes too high (for example, when climbing steep grades in high temperatures with heavy loads, such as when towing a trailer), engine power and, under some conditions, vehicle speed will be decreased automatically to reduce the chance of transmission damage. Vehicle speed can be controlled with the accelerator pedal, but the engine and vehicle speed may be limited. If the vehicle is driven under extreme conditions, such as excessive wheel spinning and subsequent hard braking, the fail-safe system may be activated. The MIL may come on to indicate the fail-safe mode is activated, see “Malfunction Indicator Light (MIL)” in the “Instrument and controls” section. This will occur even if all electrical circuits are functioning properly. In this case, place the ignition switch in the OFF position and wait for 10 seconds. Then push the switch back to the ON position. The vehicle should return to its normal operating condition. If it does not return to its normal operating condition, have a NISSAN dealer check the transmission and repair if necessary. When the high fluid temperature protection mode or fail-safe operation occurs, vehicle speed may be gradually reduced. The reduced speed may be lower than other traffic, which could increase the chance of a collision. Be especially careful when driving. If necessary, pull to the side of the road at a safe place and allow the transmission to return to normal operation, or have it repaired if necessary. 1. To engage, firmly depress the foot brake. ● Move the shift lever to the P (Park) position. ● Firmly depress the parking brake pedal and it will release. ● Before driving, be sure the brake warning light goes out.